I really enjoyed Maggie Nelson’s The Red Parts, and was quite keen to get to another of her non-fiction books; thus, I borrowed The Argonauts from my local library. From the outset, the writing here is intense, far more so than I was expecting. Nelson gives a series of short reflections or memories, along with sections of philosophical musing on her part. These are interspersed with more critical work on feminists and gender; yes, there is a lot of Judith Butler here. Whilst some of these short paragraphs continue their threads for a while, others are quite fragmented, and seem almost to have been randomly pieced together. One cannot argue that Nelson is not a highly intelligent writer, but I must admit that I did not find The Argonauts an overly approachable book. It felt more like a piece of criticism which I would read for my thesis, rather than one which I could relax with in the evening. It took me quite a while to get into, particularly as the narrative voice jumps around so much: parts of this are addressed to Nelson’s partner, artist Harry Dodge in a second person voice; other sections of it use a critical, omniscient voice; and others still use the first person perspective. The Argonauts is certainly an important memoir, but overall, I feel as though it was not quite to my taste. What appears in the book is not at all what I expected; The Red Parts felt far better put together to me. Some parts of The Argonauts appealed to me far more than others. I came across Ilene Beckerman’s quirky autobiography, Love, Loss, and What I Wore, when browsing through my Goodreads homepage. I had never heard of the book, or of its author, before, but was immediately intrigued, and set off to find myself a copy. Here, Beckerman’s memories are woven in with her own illustrations of what she wore at a particular time of her life, or for a special occasion. We see her Brownie uniform, rag curls, a ballet outfit, her confirmation dress, a circle skirt which she made with a friend, ‘typical underwear’ which she often wore on dates, the bridesmaid’s dress for her best friend’s wedding, and a dress she wore during each of her six pregnancies, amongst many others. I loved the approach which Beckerman makes here, with a short body of text and an accompanying illustration for each essay. I found it a really interesting, and quite unusual, way in which to present a memoir. Along with her own outfits at given points in time, she focuses upon the people who shaped her too – what her elder sister wore to a wedding, for example, and her grandmother’s chosen hairstyle. Love, Loss, and What I Wore is quite a quick read, but a very thoughtful one, and I appreciated the dry humour which Beckerman has sprinkled in. In 1994, Clemantine Wamariya, then aged six, and her fifteen-year-old sister Claire, fled the Rwandan genocide from their home in the country’s capital, Kigali. They spent the following six years in seven different African countries, ‘searching for safety – perpetually hungry, imprisoned and abused, enduring and escaping refugee camps, finding unexpected kindnesses, witnessing inhuman cruelty.’ The sisters had no idea, during this period, whether their parents were alive, or what the fate of their other siblings had been. Wamariya’s experiences are recorded in The Girl Who Smiled Beads: A Story of War and What Comes After. I was personally very young during the Rwandan genocide, and learnt nothing about it until long afterwards. This is the first memoir which I have picked up about the horrifying conflict and its many victims. When the conflict begins, Wamariya explains that she was in much the same boat; she noticed that things were changing around her, but nobody thought to even attempt to explain why this was the case. She says, two years before she fled, ‘In my four-year-old imperiousness, I believed I could handle the truth. I thought I deserved to know. I demanded it.’ She is left to work things out by herself: ‘Houses were robbed, simply to prove that they could be robbed. The robbers left notes demanding oil, or sugar, or a TV. I asked adults to explain, but their faces had turned to concrete, and they nudged me back into childish concerns.’ To Wamariya, the conflict – at first, at least – is therefore comprised of a series of things which are suddenly forbidden, or taken away from her; for instance, her days at kindergarten, her best friend, electricity, and no more dinner guests. I very much enjoy Eudora Welty’s fiction, but know comparatively little about her childhood. I read the wonderful What There Is To Say We Have Said a couple of years ago, which features much of the correspondence between Welty and another favourite author of mine, William Maxwell. This autobiographical work, which is composed of a wealth of memories largely from Welty’s Mississippi childhood, works as a wonderful companion volume. In One Writer’s Beginnings, which was first published in 1984, Welty decided to tell her story in one ‘continuous thread of revelation’. The book provides, says its blurb, ‘… an exploration of memory by one of America’s finest writers, whose many honours include the Pulitzer Prize, the American Book Award for Fiction, and the Gold Medal for the novel.’ This book consists of three essays – ‘Listening’, ‘Learning to See’, and ‘Finding a Voice’ – which have been transcribed from a set of three lectures which Welty gave at Harvard University in April 1983. Lorna Sage’s Bad Blood has, like many of the books I review, been on my to-read list for years. I so enjoyed her non-fiction book, Moments of Truth: Twelve Twentieth Century Women Writers, and was eager to read more of her work. Rather than a collection of critical essays, Bad Blood is a memoir of Sage’s early life in rural Wales during the 1940s and 1950s, and ends with her University graduation. It was published in 2000, and won the Whitbread Prize for Biography just a week before Sage passed away. Sage had such a gift for capturing vivid scenes and unusual characters. The memoir opens with the following description: ‘Grandfather’s skirts would flap in the wind along the churchyard path and I would hang on. He often found things to do in the vestry, excuses for getting out of the vicarage (kicking the swollen door, cursing) and so long as he took me he couldn’t get up to much… He was good at funerals, being gaunt and lined, marked with mortality. He had a scar down his hollow cheek too, which Grandma had done with the carving knife one of the many times when he came back pissed and incapable.’ Due to the sheer amount of time which Sage spent with her grandparents, who tolerated each other at best, she had very few memories of being with her parents when she was little. Of her soldier father, away at war, she recalls only that she was picked up by him and was ‘sick down his back’. Bad Blood presents a multi-generational family portrait; Sage scrapes away at the veneers of her family, and reveals what it has been hidden far beneath the surface. She writes with such sincerity about her somewhat dysfunctional upbringing, spent more with books than people, and describes the changing post-war landscape with such detail. Throughout, Sage’s narrative voice is lilting and friendly, and she speaks about such varied things, from fashion, farming, and food, to schooling, swimming, and sharing. I enjoyed the second and third sections of the memoir the most; in these, Sage played a more active role in proceedings, rather than merely telling the reader about her grandparents and parents in rather an omniscient manner. The Path Through the Trees, the second volume of Christopher Milne’s autobiography, was first published in 1979, and has been recently reissued by Bello. It starts where The Enchanted Places ‘left off’, but, the author says, this book ‘is a complement [to it]. It is about the non-Pooh part of my life. It is an escape from Christopher Robin’. In The Path Through The Trees, Milne presents what he thinks of as ‘a disjointed story – but a happy life’. He describes the second part of his autobiography as follows: ‘So I live at the bottom of a valley. I have a small bookshop in a small town; and I seldom venture far afield’. In the book, his story begins at ‘the point in time when the choice stopped being theirs [his parents’] and became mine’. It opens with the declaration of the Second World War, when he has finished at his public school and is about to go and study at Trinity College, Cambridge. A few of the themes which were so prevalent in The Enchanted Places weave their way into The Path Through the Trees, most notably the importance of nature and Milne’s love for his natural surroundings. The Path Through the Trees is written just as eloquently as the former, but the entirety feels far more grown up. Milne talks about smoking for the first (and last) time, forays into politics, his joining up with the Army, discovering himself as a person, his marriage, and becoming a father. Records from his personal diary have been copied verbatim. Whilst the charm of the first book has not made its way into the second, The Path Through the Trees is still a most interesting read, particularly when Milne reaches his acquisition of the Harbour Bookshop in the small town of Dartmouth. It is at this point that the book really comes into its own. One cannot help but feel, however, that the same kind of leap between volumes of autobiography is present here as exists between Roald Dahl’s Boy and Going Solo. The spellbinding note has been lost somewhere along the way, and sadly, a lot of it tends to read just like any other memoir. Christopher Milne’s The Enchanted Places is one of the newest books on Bello’s thoughtful list of reprints. He was the son of A.A. Milne, and the inspiration for the darling character Christopher Robin – ‘the small boy with the long hair, smock and wellington boots’ – who shares his adventures with a cast of lively and captivating animals, including Pooh and Piglet. The Enchanted Places has been written from the vantage point of the author’s mid-50s, and tells of his childhood in the ‘enchanted places’ in Sussex in which he used to play – the Hundred Acre Wood, Poohsticks Bridge and Galleon’s Lap, among others. As well as talking of his own adventures as a young boy, Milne ‘draws a memorable portrait of his father… [in] a story told with humour and modesty’. The Enchanted Places, first published in 1974, is the first book in Milne’s three volume autobiographical series, and deals solely with his life as a young boy. His memoirs begin ‘somewhere around the year 1932’ in his Crotchford Farm home, a place which he and his family adored. Milne describes the reason for which he decided to write about his life as follows: ‘To some extent, then, this book is an attempt to salve my conscience; and it may perhaps be some slight consolation to all those who have written and waited in vain for a reply that this, in a sense therefore, is their reply’. Throughout, The Enchanted Places is absolutely charming, and full of vivacity. Milne’s descriptions are beautiful, and it is clear that he was forever full of love for both nature and life. Rural England springs vividly to life beneath his pen. Each chapter presents a mini essay of sorts on one subject or another, and whilst Milne’s prose style echoes his father’s, there is also something wonderfully original about it. Milne is a rather humble man, and comes across so nicely on the page. He takes the reader on a journey back in time with him to encompass his nursery days, his forays into the Hundred Acre Wood, tours of his home, the discovery of his very first treehouse, and the adoration he held for his childhood nanny. He goes on to talk of the problems which he encountered due to his immortalisation in fiction, and demonstrates how his father’s fame impacted upon him from such an early age. The Enchanted Places is a quaint and an incredibly lovely read, and is sure to be a welcome addition to any bookshelf. 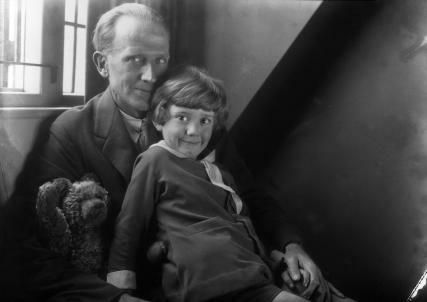 The natural settings and shyness of Milne as a young boy have been captured perfectly, and the book presents a rich treasure trove of memories, certain to enchant everyone for whom Winnie the Pooh was a part of childhood. I am beginning this instalment of the Book Trail with a memoir I stumbled across, and have added right to the top of my TBR list. As ever, I have used the tool on Goodreads entitled ‘Readers Also Enjoyed’ to create this list. Have you read any of these? Which interest you?